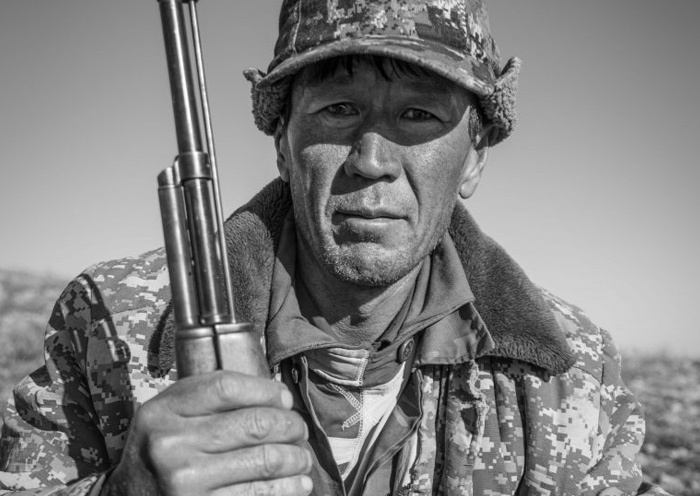 Last year, my father and I were looking for a hunt that we could go on together, and after some research settled on a Mid-Asian ibex hunt in Kazakhstan. 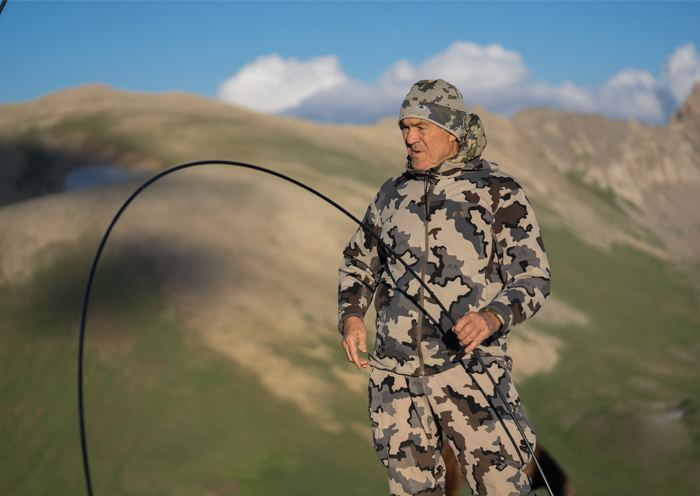 Having previously hunted ibex in Kyrgyzstan, on this trip we decided to hunt in the Tian Shan Mountains of Kazakhstan. 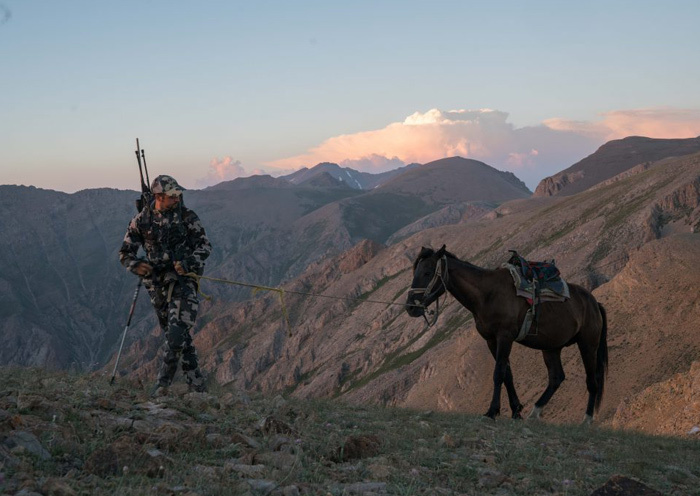 Working with our hunting agent, Jordi Figarolas from Aventure Boreale, we settled specifically on Sayram Ugam, located in the southwest of Kazakhstan, on the border with Uzbekistan. 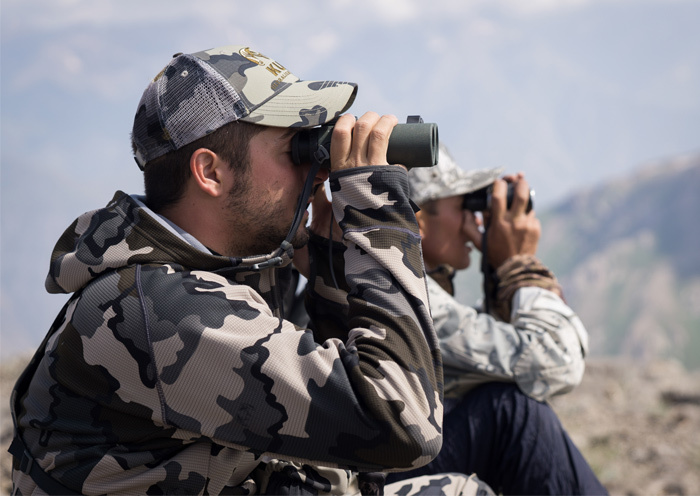 The ibex we would be hunting were the Tian Shan Ibex (Capra Sibirica Alaiana), also referred to as the Mid-Asian ibex. 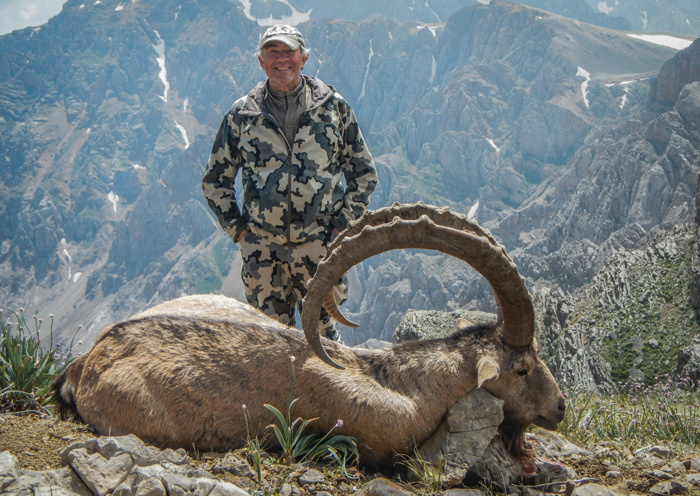 Located in the Pamir, Alai, Transalai, and Tian Shan Mountains in Afghanistan, Tajikistan, Kyrgyzstan, Kazakhstan, and China, they are the largest of the ibex species and can grow the largest horns, too. 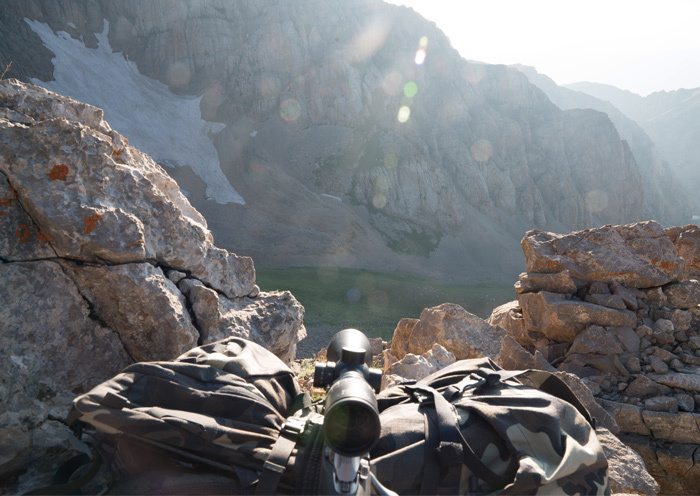 In this particular region, ibex hunting opens the beginning of August and lasts until December. 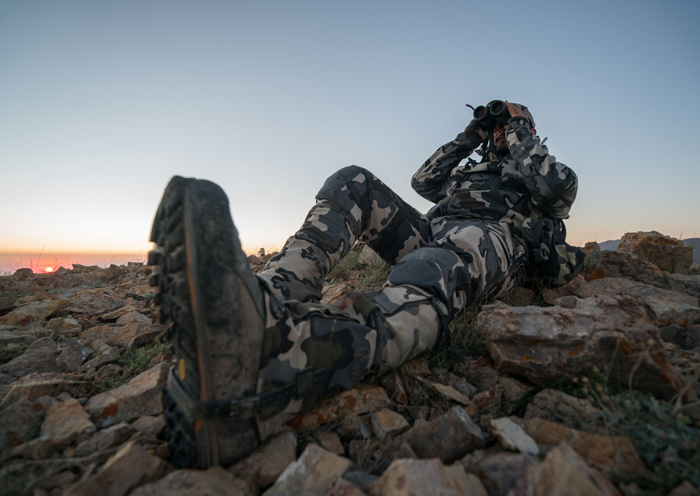 We decided to start our hunt at the beginning of the season, knowing this was likely to be the best weather, and since most big game hunting is closed this time of year in Spain, where we live. 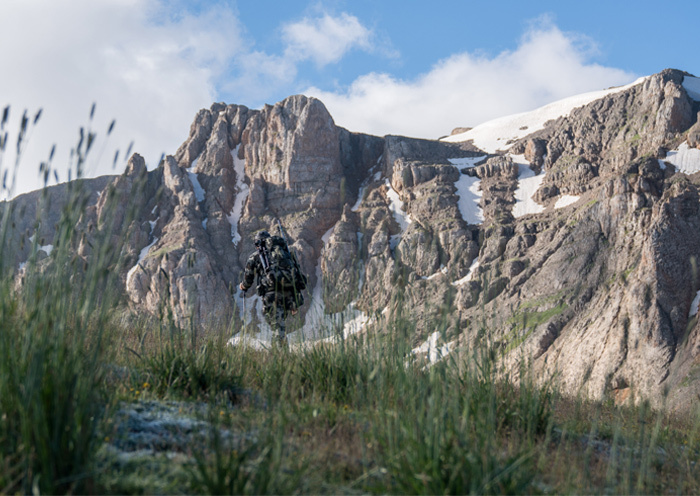 Even with the good weather, hunting ibex this early in the season presents challenges: the ibex are high up in the mountains, requiring hunters to be in very good physical condition, and the ibex tag can’t be combined with any other animal. 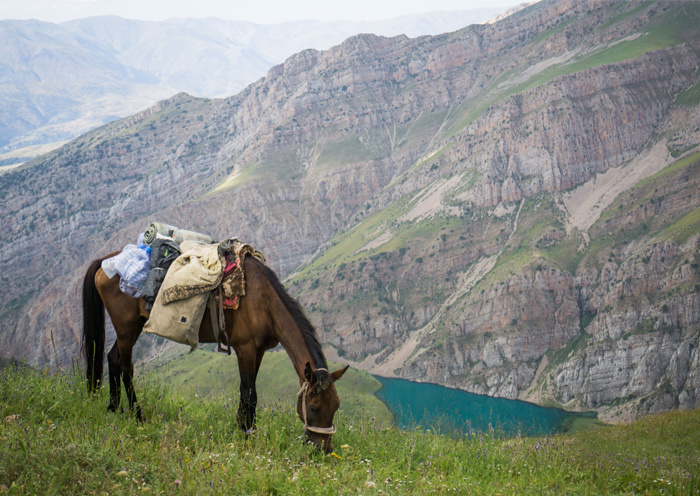 From Spain, we flew to Istanbul and eventually to Almaty, Kazakhstan, and then to our destination of Shymkent. 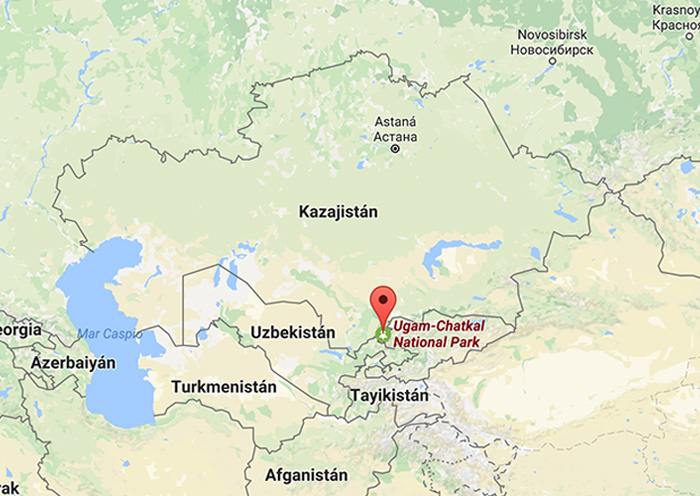 From there, we had a four-hour drive to the Sayram Ugam Game Reserve. 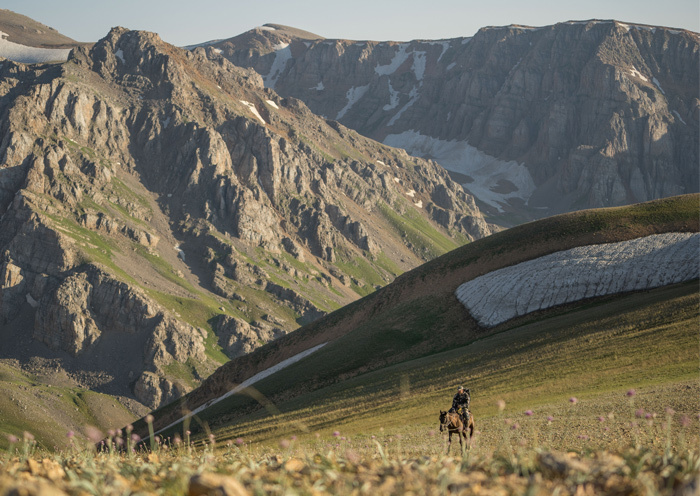 After a quick lunch, we rode horseback to our fly camp, a trip that took five hours and resulted in a 1500 meter / 5,000 ft climb in altitude. 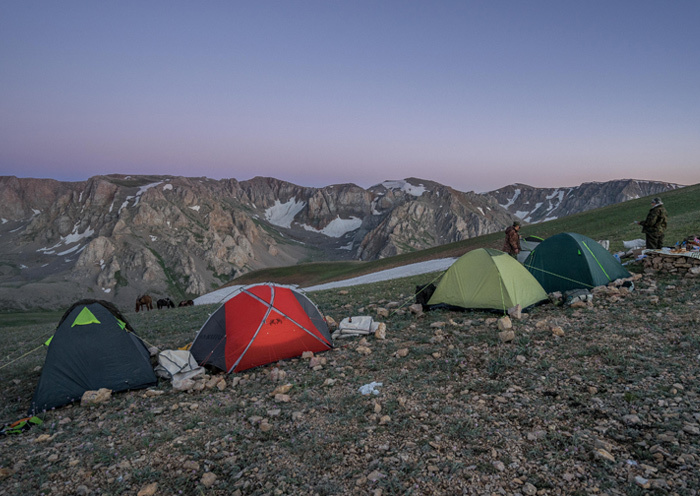 We arrived just in time to set up tents and enjoy a gorgeous sunset at 3200 meters / 11,000 ft. 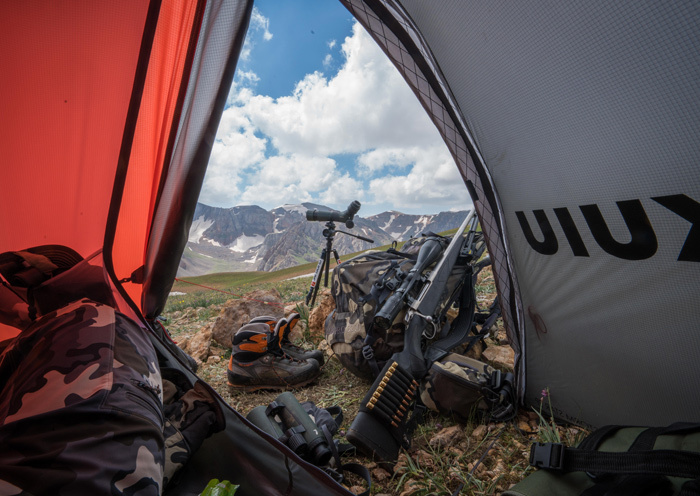 The view from camp was simply amazing—you can never get tired of looking at a place like that, especially when there were already some ibex in the distance. 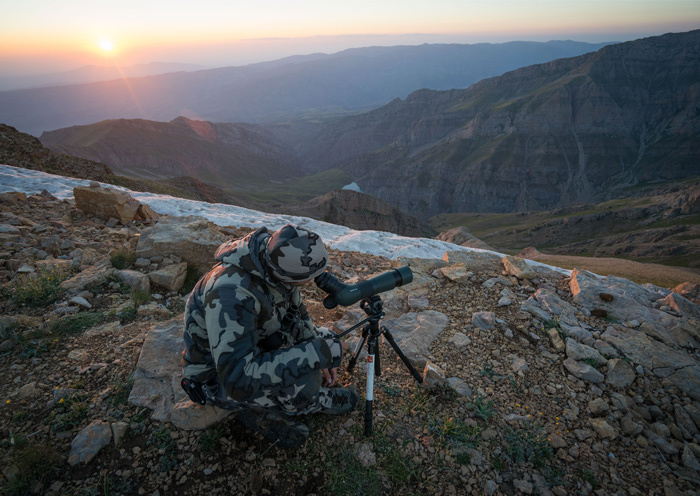 We woke up the next morning at first light, set up the spotting scopes, and started glassing. 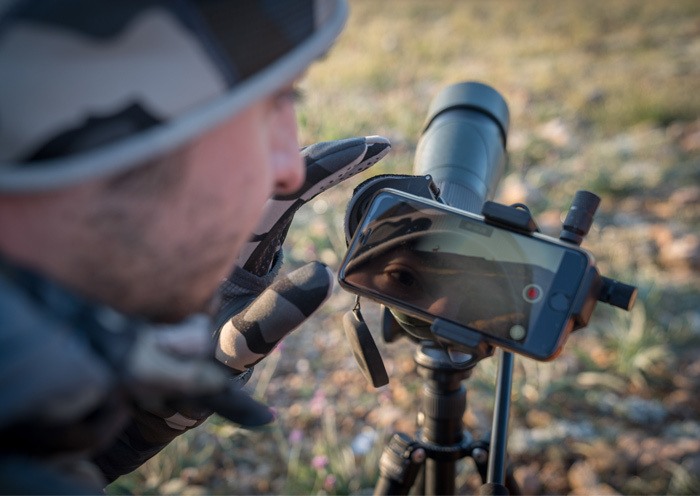 We could glass more country from camp than we could cover in a day, so we spent time behind the scopes while deciding on our plan for the day. 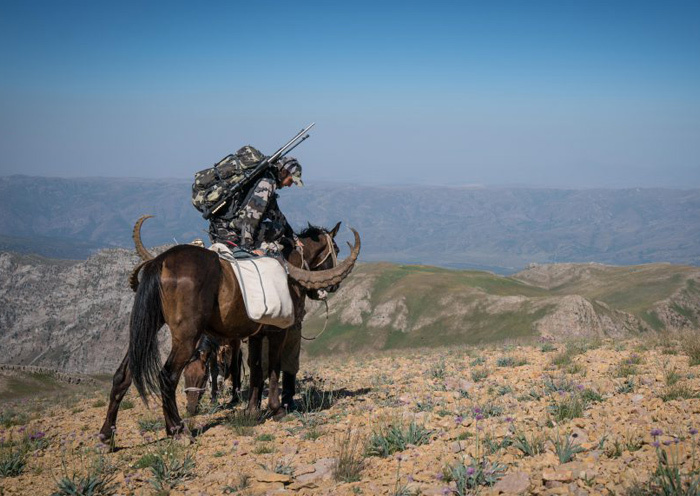 A group of billies appeared in the distance, just a few kilometers away, and a couple of them looked like possible shooters. 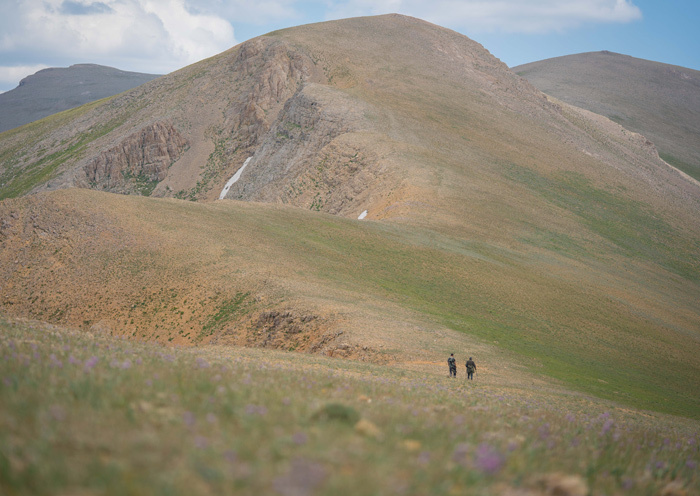 We didn’t hesitate—we got our packs on and started veering the distance to get a closer look. 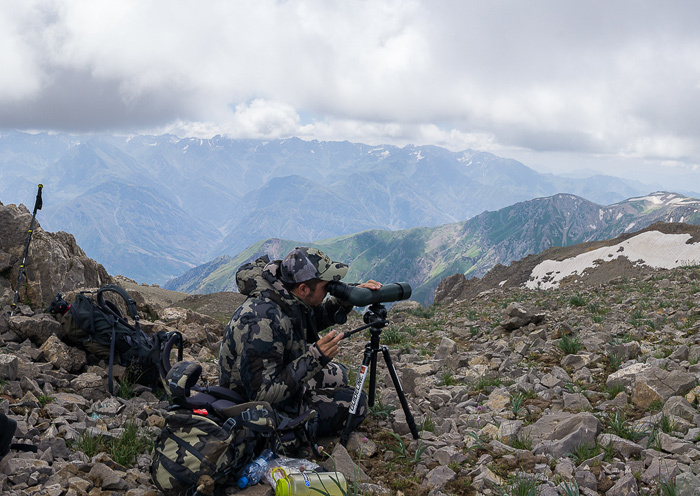 My dad went the opposite direction to check out an area that our guide had high hopes for seeing some ibex. My guide and I moved quickly, and decided to climb a vertical wall to not spook the ibex. 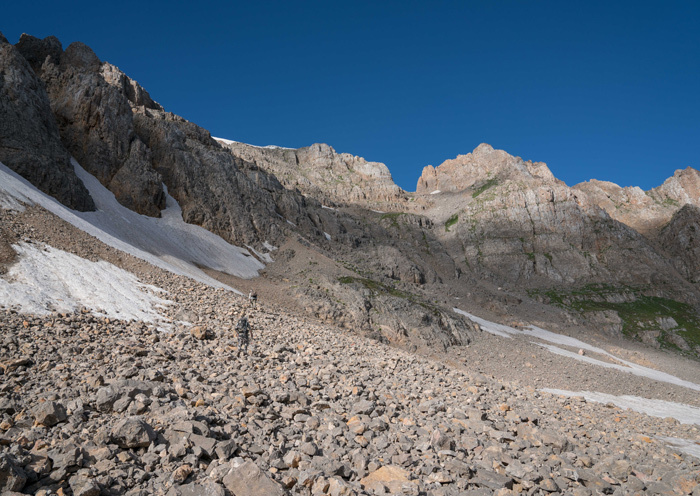 Although we were in early August, all the game seemed to be staying over 3200 meters / 11,000 ft in elevation, so there was still snow in several areas. 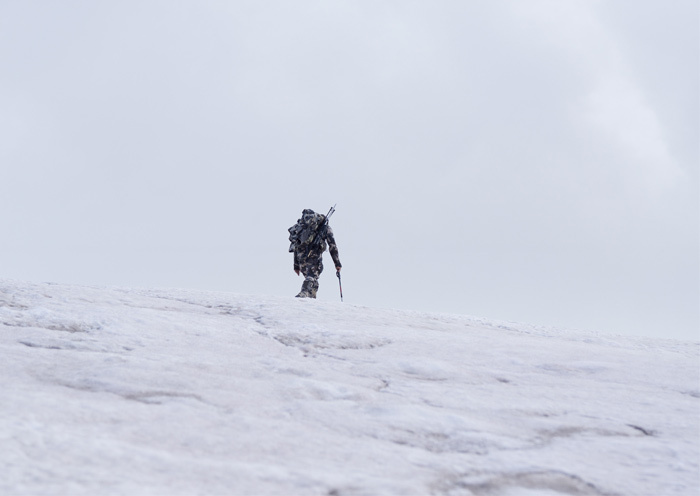 While I was glad to have my semi-rigid alpine boots, I missed not having my ice axe with me. 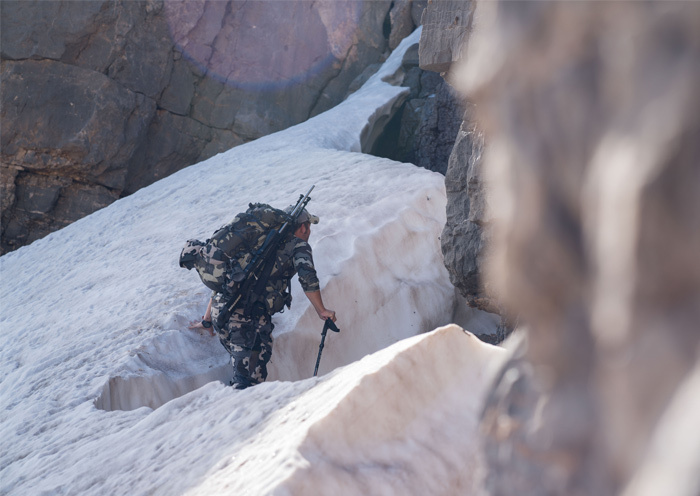 We crossed a couple of frozen snow banks that required us to create steps in with a knife to be able to have secure footing. One mistake in this terrain and there would be been no way to stop on that slick ice before hitting a deadly finish line. 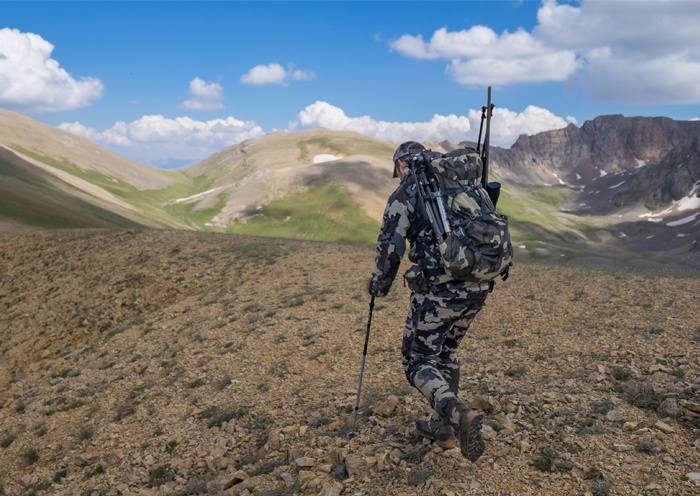 We reached the top of the ridge line and saw a few ibex, but nothing big enough to shoot. We spent the rest of the day hiking without seeing much movement, until we spotted a big group of billes bedded down, quite a few kilometers away. 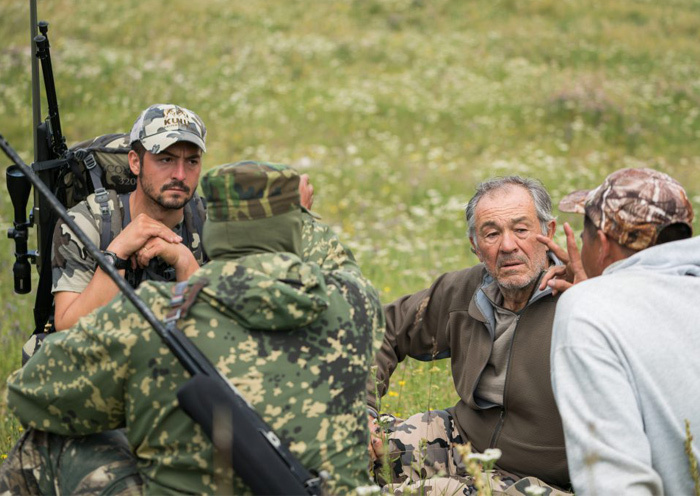 Through the spotting scope, we could see my dad heading toward the group. We kept watching, and a few hours later we watched my dad crawling closer, and finally heard a gun shot. The whole herd ran away, except one billy. It didn’t take long to get a call on the radio; my dad had dropped a beauty, and I’d been able to see the whole thing go down. 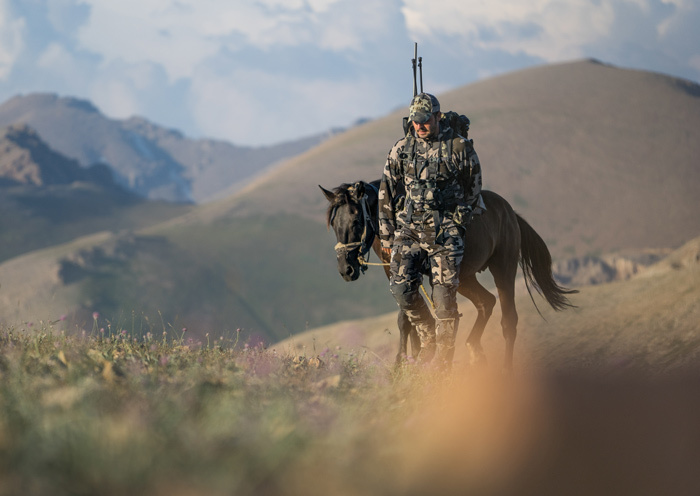 Sometimes it can be tough to shoot an animal on the first day of a hunt, but after a lot of hunting trips abroad, you learn to take the opportunities as they come. 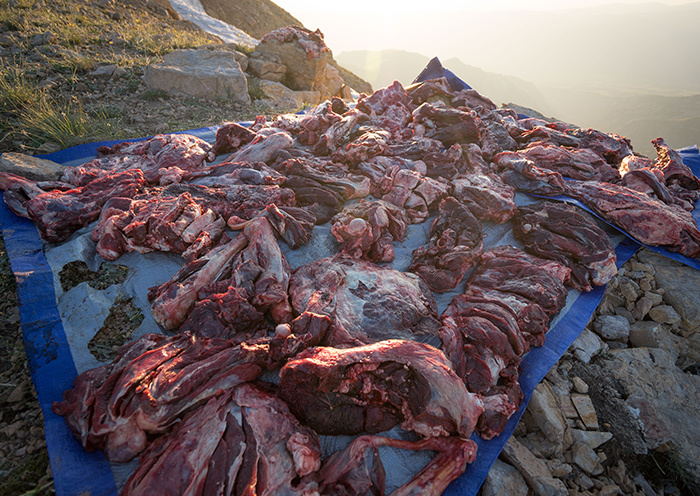 As every hunter knows, any time you pass up an opportunity to take a good animal at the beginning of the hunt, you always end up regretting it at the end. 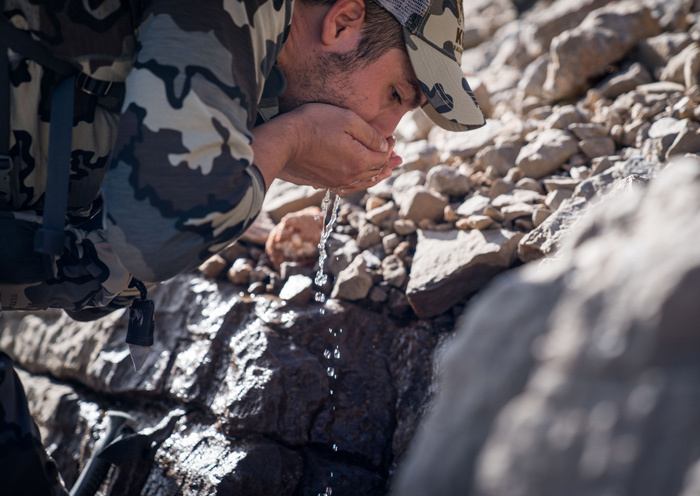 We’ve all been in that spot before, and I was happy that on this hunt my dad had taken a great Ibex on the first day. 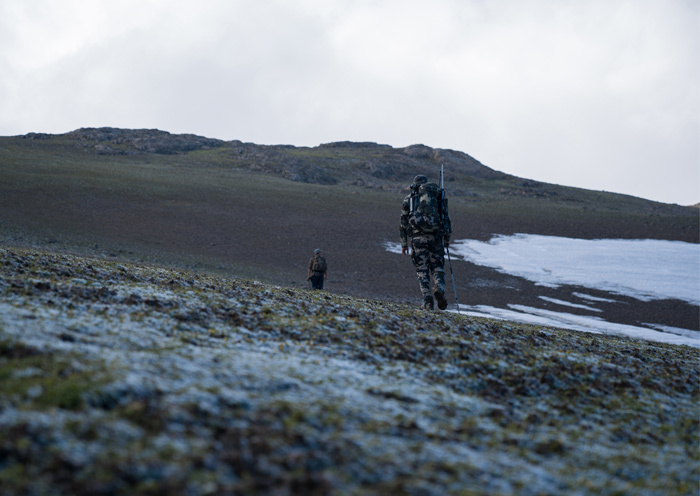 With several hours of daylight left, my guide and I continued hiking to a couple of valleys further up the ridge line. 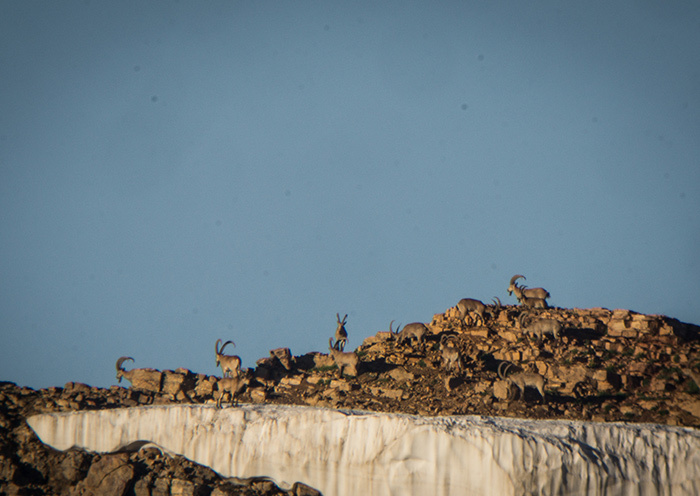 As the sun started getting lower, we began seeing more Ibex. 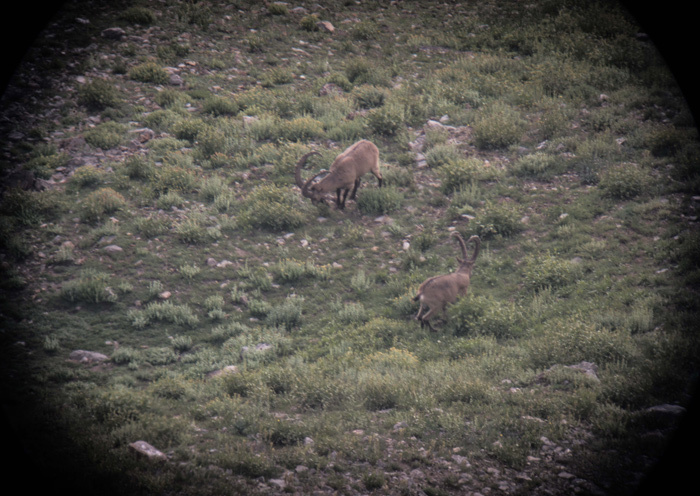 This early in the season, Ibex typically only move early in the mornings and late in the afternoons, spending the midday hours lying down in the shade. We spotted a group of billies looking for fresh grass down at the bottom of a valley. A couple of them looked pretty good, so we started a quick descent, hoping to get the chance at a shot before sunset. 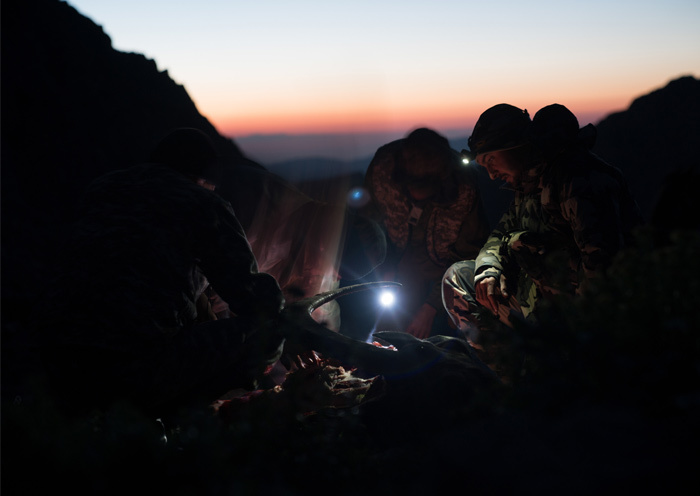 After reaching the last possible cover we had, we peaked over slowly at the group of 20 ibex, feeding calmly. There were a couple that were clearly bigger than the rest, but it was hard ot decide which was the biggest of the group. I focused on a billy that was lying down as his body and horns were massive. 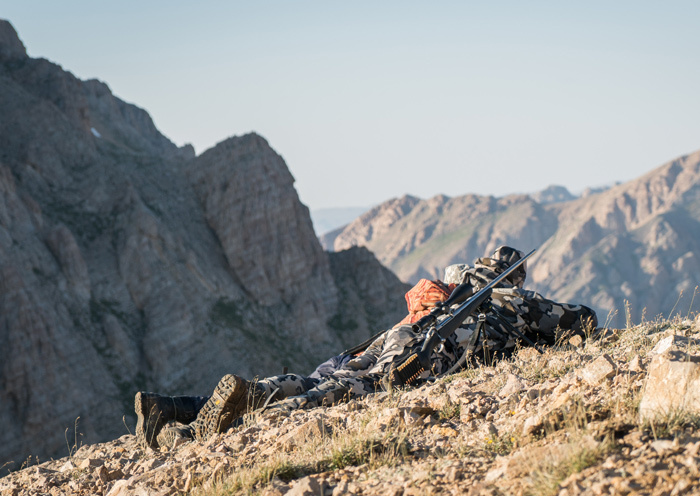 He was bedded down at 350 meters, but my binos were calling for a 300-meter shot to compensate for the angle we were at. I took the best rest I could and settled my breath before squeezing the trigger. My shot hit him right in the lungs. The ibex ran a hundred meters and started wobbling. 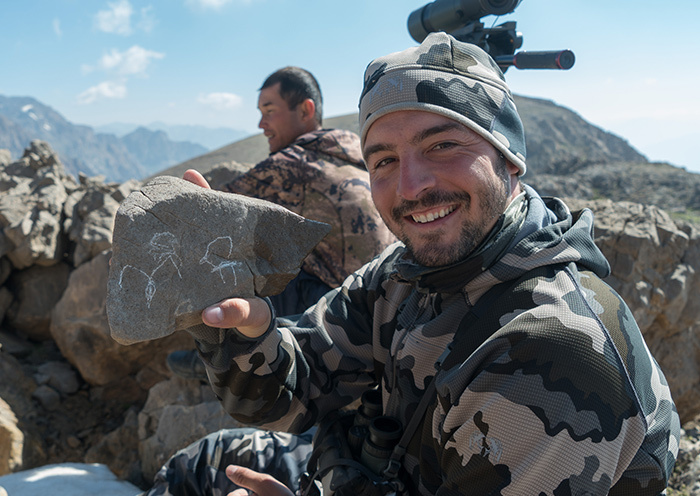 I was trying to get a distance reading from my guide, and it took me awhile to understand his hand signals calling the distance at 430 meters. At that distance, and a 7mm Remington Mag with a 150-grain bullet, the drop is about two hands. Knowing those numbers was critical. 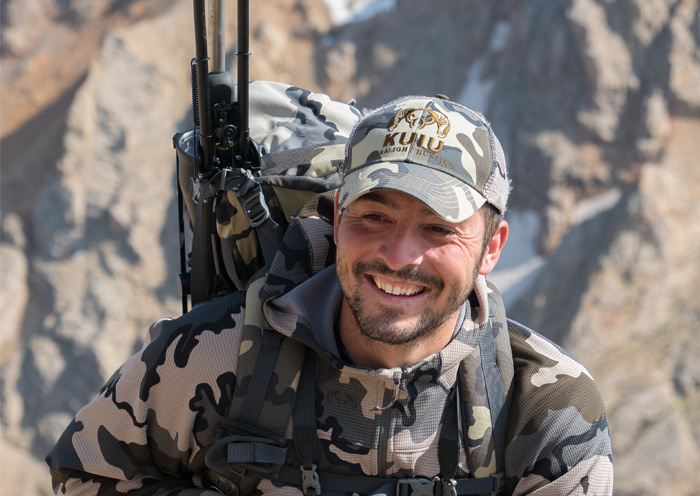 I shot again, hitting the ibex and getting him down. 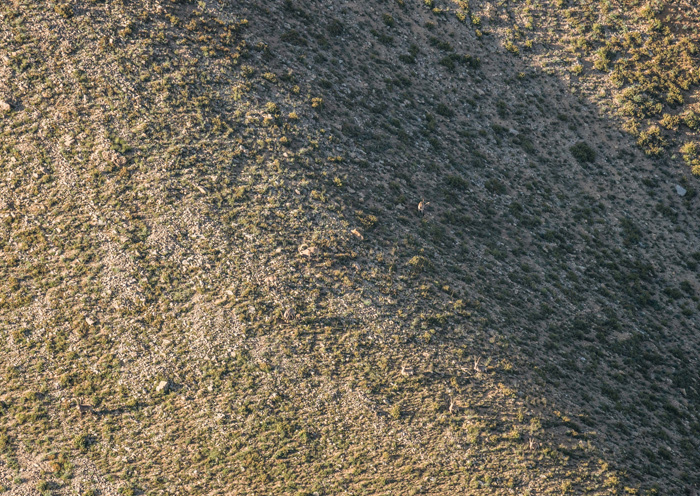 I’m convinced that this is one of the best feelings in the world: being on top of the world, in the middle of nowhere, with a setting sun and an ibex down on the ground. 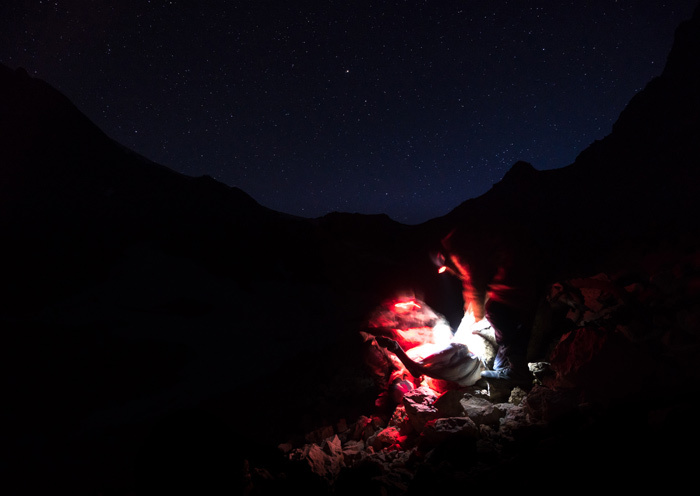 It was too bad that we couldn’t freeze the watch and stop time to enjoy it a little more, but we were running out of light and we had a lot of work ahead of us to get back to camp. After a long night of packing out, we slept in the next day to recover. 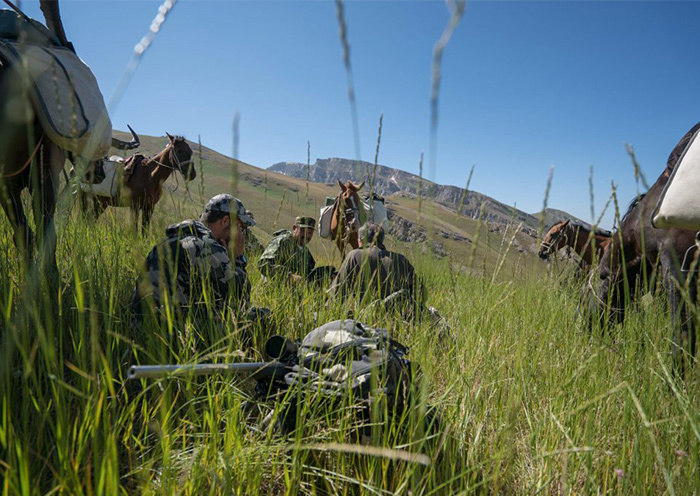 We had six more days of hunting to try to fill our second tags, so we spent some time preparing the skins, organizing gear, and exchanging stories with each other about the little details the make every hunting story so unique. 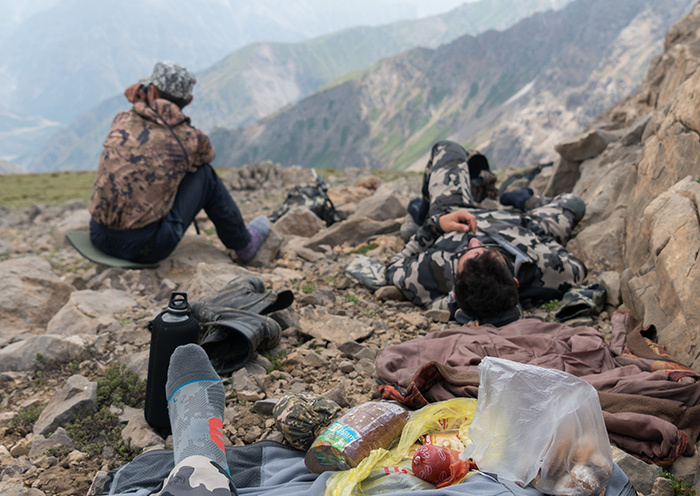 That afternoon, we took a short hike to a vantage point in hopes of spotting some ibex to go after the following day, and through the binoculars we saw a group of young billies and nannies being attacked by a snow leopard. 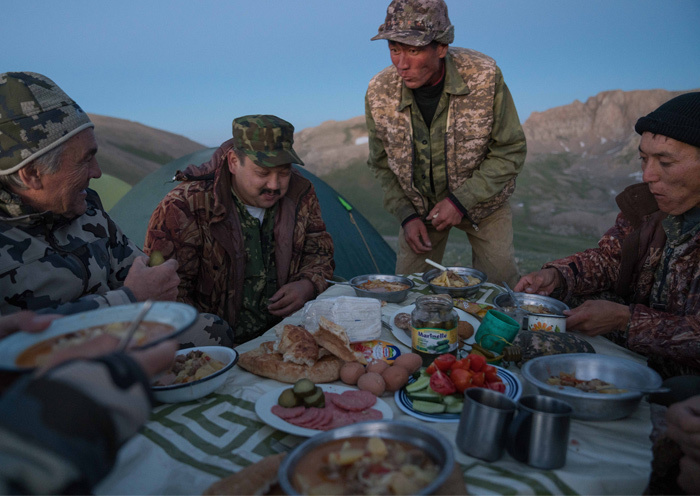 Those animals are tough to see, but are impressive hunters. I was wishing I could run the mountains as easily as they could. We went to bed that night with plans of heading out at first light, but my dad started having sever back pains. 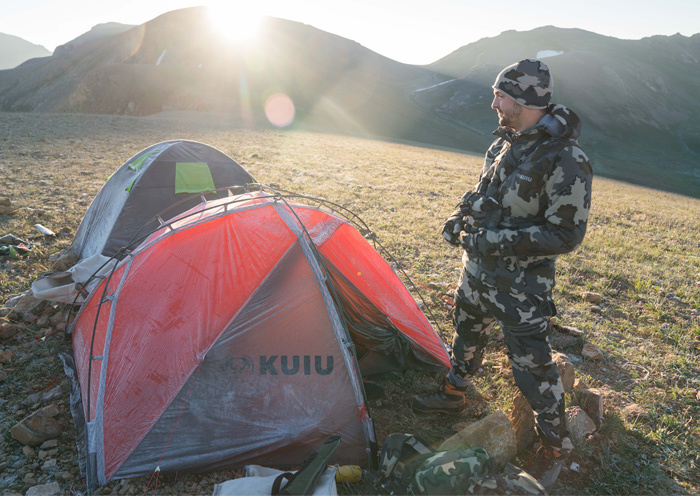 He took some pain pills with the hopes of being able to hunt the next day, but a cold, windy night spent sleeping in a tent didn’t do much to help his recovery, and his pain was worse in the morning. 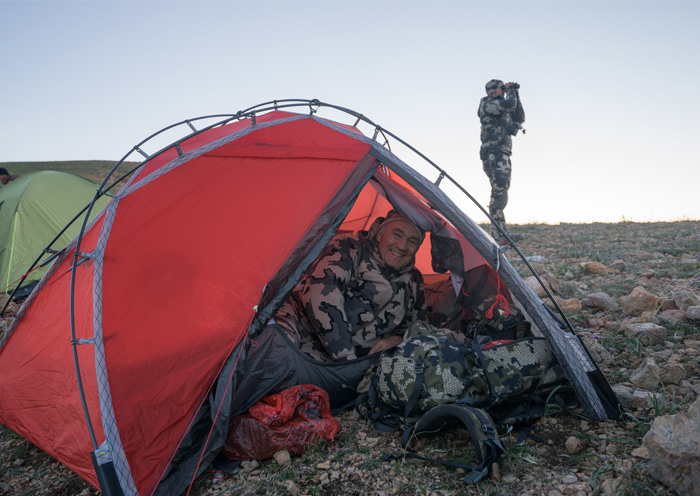 He made the decision to stay on at camp while we headed out in search of more ibex. We had spotted a group in the distance, and decided to go after them with dad’s urging. 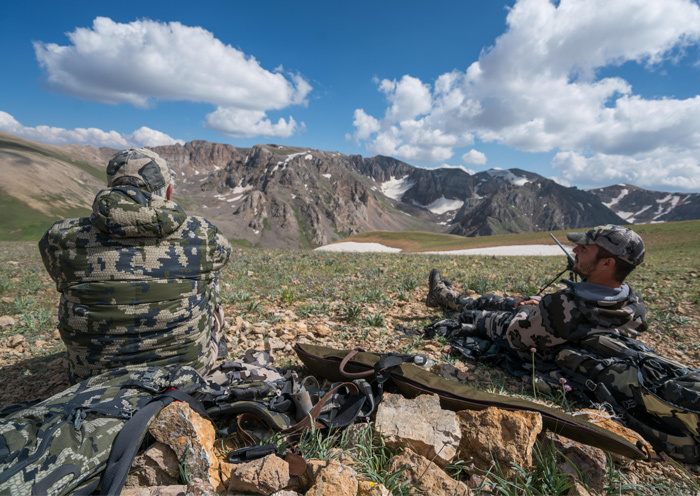 Despite what some people might think, 80% of mountain hunting is glassing, waiting behind good optics. 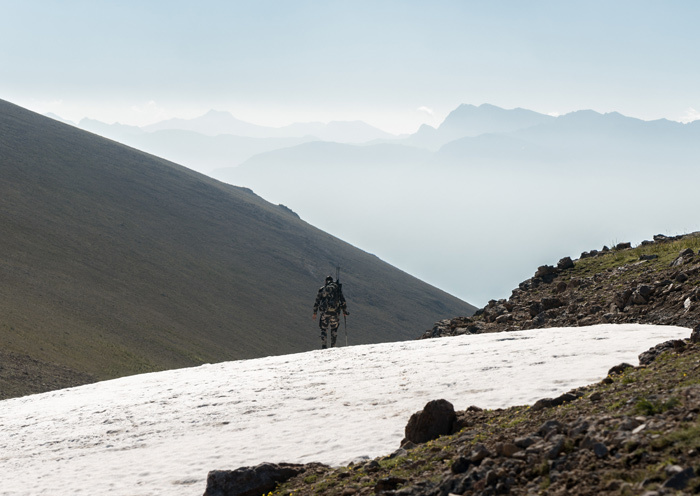 It’s not about how much or how hard you can hike, but how smart you can hunt. You have to let the glass do the walking for you, patiently waiting for the right moment. 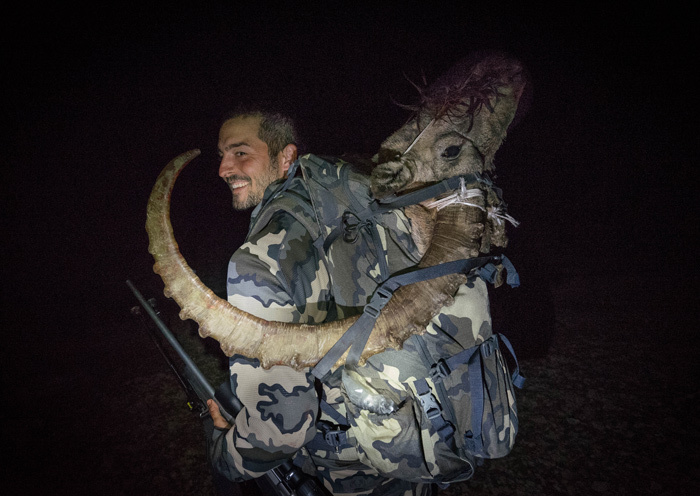 Rushing a stalk and spooking an animal can cost you days of searching for another chance. Patience was what this stalk required. 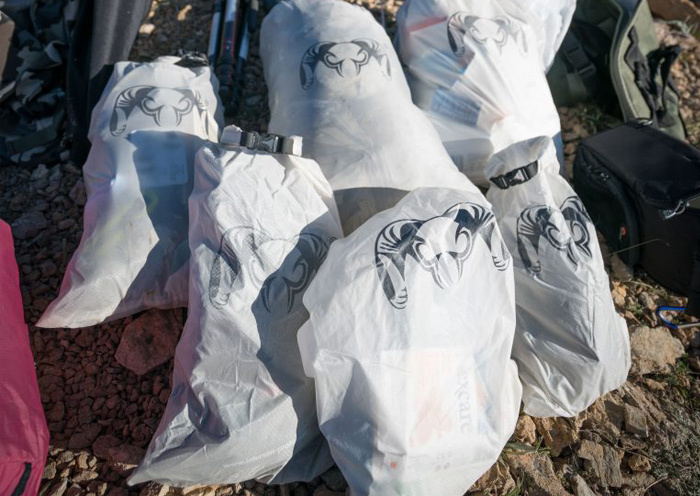 We spent more than five hours waiting for the bedded ibex to stand. In my experience, bedded animals have nothing else to do but look for signs of danger, so I typically prefer to stalk animals when they are on the move and are distracted by feeding and walking. The whole time I was waiting, all I could think about was my dad, in pain and stuck back at camp. 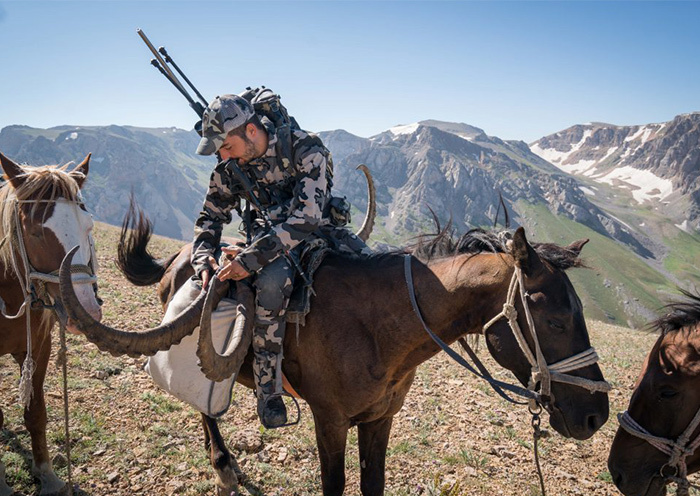 There are so many things that can go wrong on any hunt, and we both knew how lucky he was taking such an incredible ibex on his first day. 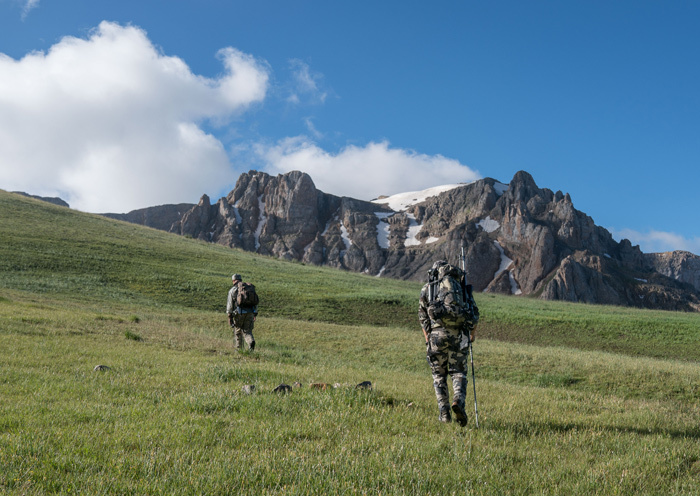 As I was waiting on the ibex to stand, it was on my mind that we should be spending the day back at camp with my dad. I knew that I needed to get one of the billies in this group so that I could spend the rest of the hunt close to my dad. 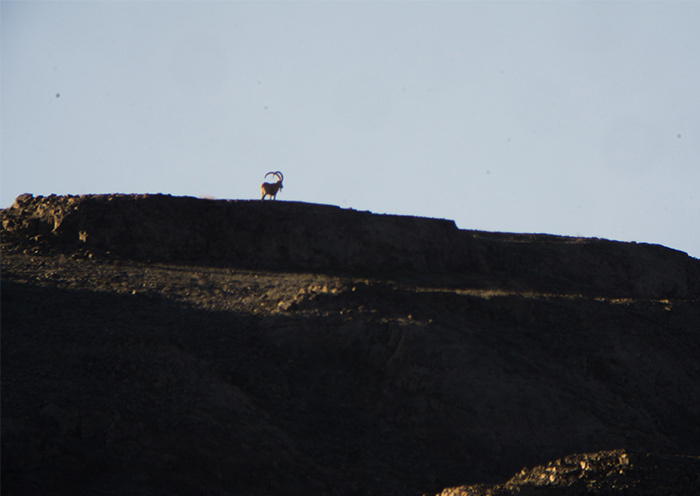 As they always eventually do, the ibex finally stood up, walking the opposite direction from where we were glassing. We started our stalk, and after a couple of hours we were watching the whole group from about 500 meters away. 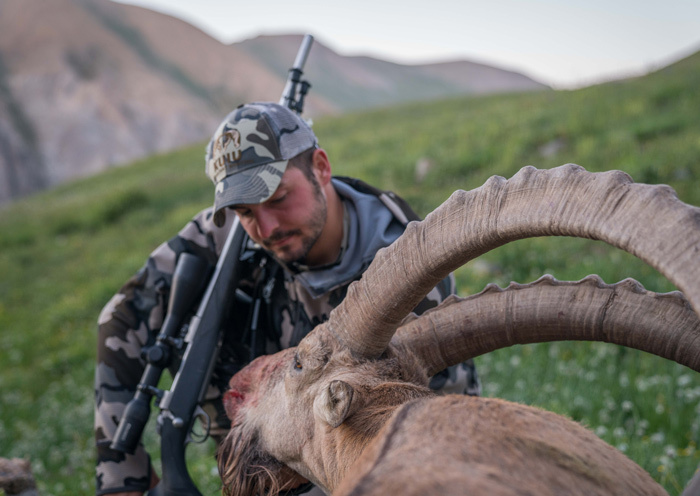 There were a couple of good ibex in the herd, one with a long curve in his horns, but at that point I only had eyes for a super wide billy. I have always liked wide ibex, and although they are not typically as long as the others, they are beautiful. 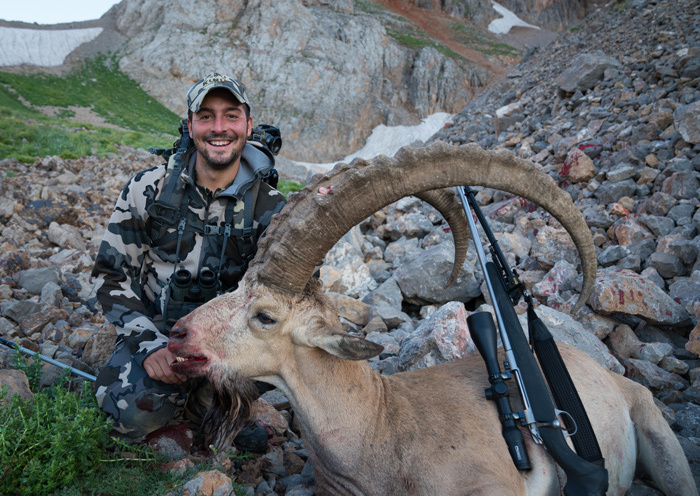 This ibex also happened to be the oldest, and age is the most important factor to me when choosing an animal. The guide team I was with was calling for me to take a long shot, but I like to get as close as possible-—that’s what hunting is all about. 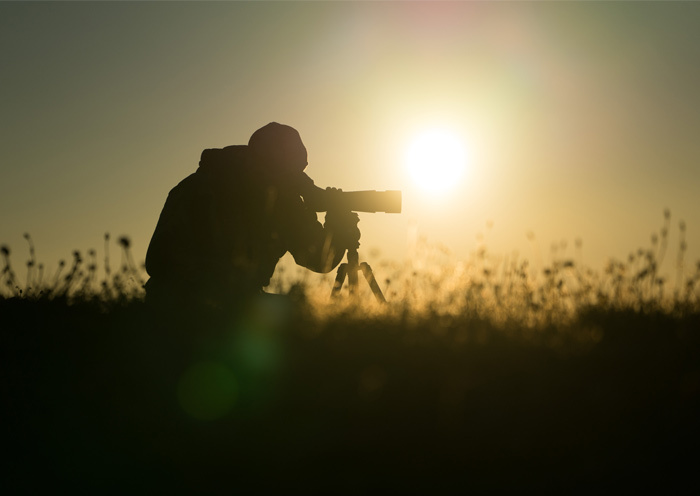 The sun was setting down, and I knew that there was no way I’d have a chance at this working out with a guide and cameraman with me, so I told them to wait: I was going alone. I dropped my backpack and started heading down as fast as I could. Every second counted. I finally got within shooting distance, set up on some rocks, aimed and squeezed the trigger. My shot barely touched his back, and set the whole herd running. Luckily, the ibex I shot came running toward me; with such wide horns he was easy to recognize. I put him down with a couple more shots as he ran closer and closer. As the rest of the group joined me, we all had big smiles as we put our hands on a 12-year-old billy. The first thing on my mind was calling my dad on the radio to check in on him and tell him the good news. 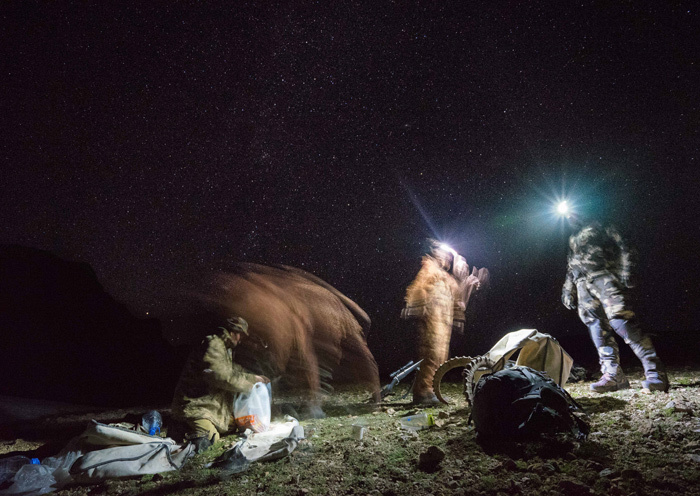 We had another long night ahead of us; we were really far from camp, on a place that horses couldn’t get to, and it was already dark. But in my mind, it was going to be fun getting back to camp! 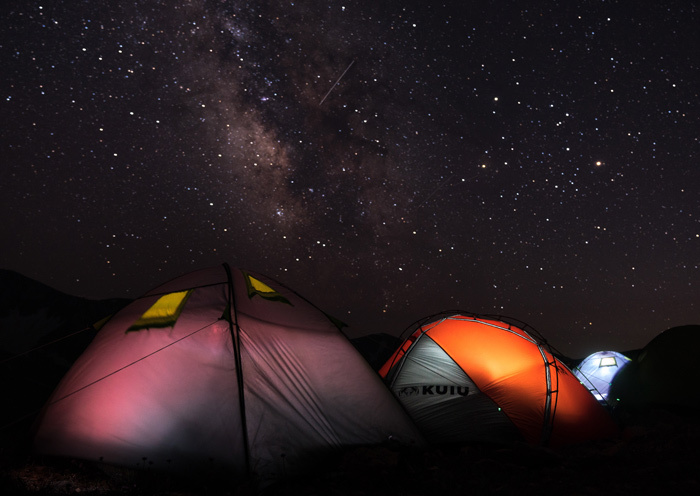 The night sky was clear, and the number of stars we could see was simply amazing. While I know that they are always there, in today’s world so much of the natural beauty that surrounds us is often hidden by civilization. We finally made it back to camp at 3:30 in the morning, exhausted but as happy as we could possibly be. The next day we woke to another beautiful sky. Dad was feeling a little better, but back injuries are pretty straightforward to treat: patience, pain medicine, and rest for three days. 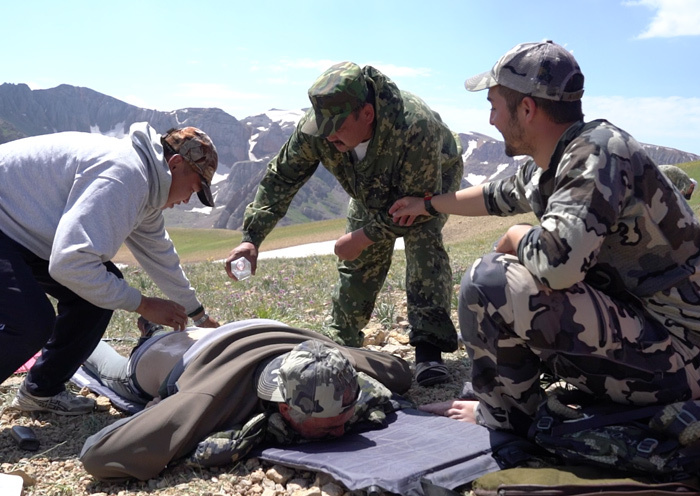 Our guides used an unusual treatment that consisted of hot Ibex fat and vodka applied to his back. It looked and smelled awful, but it did the trick: the next day Dad was ready to rock. 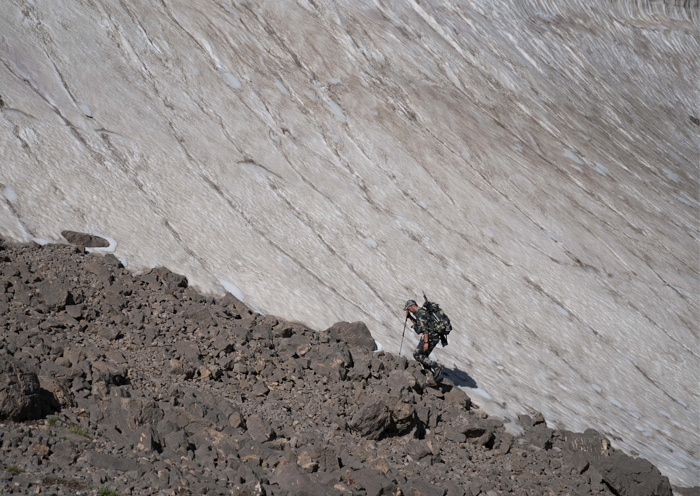 He decided that we were going to attempt to get to base camp, making a spike camp along the way if necessary. It was a long day, hiking slowly, but it was probably one of the best days of the trip for me. It had been a long time since I had been able to talk to my dad for so many hours. 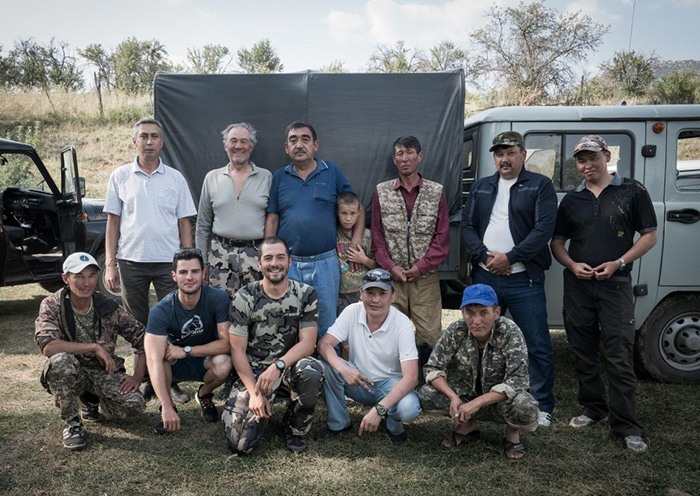 We remembered old stories, discussed important stuff like which rifle caliber is the best, and solved all of the world’s problems!